Amazon launches Cloud Drive Unlimited plan for $59.99 per year. Good Deal? 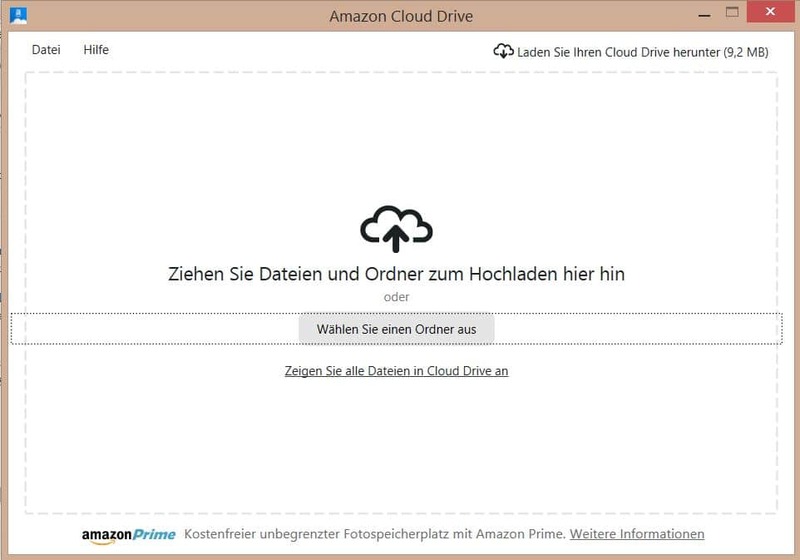 Amazon's Cloud Drive has been a contender in the cloud storage and file synchronizing vertical for some time now. Today, Amazon announced the launch of two new plans that simplify Cloud Drive significantly for all users. Unlimited Photos gives 5 Gigabyte of general storage space and unlimited photo storage to Cloud Drive users for $11.99 per year. This is the same deal that Amazon Prime members get for free. Unlimited Everything on the other hand is a new top of the line plan that gives you unlimited storage for all kinds of files for $59.99. Amazon is not the first company to launch unlimited online file storage offers. Microsoft for instance gives Office 365 subscribers unlimited OneDrive storage with their subscriptions. Both plans, the only plans left by the way, are offered as 3-month free trials for users who want to test them before they pay for them. Nothing changes for Amazon Prime users by the way as unlimited photo storage -- basically the unlimited photos plan -- remains available to them free of charge. Prime members can upgrade to the Unlimited Everything plan at any time but will have to pay $59.99 for it just like anyone else. The offer looks good on paper but the interesting question is how this compares to the offerings of other cloud storage providers such as Dropbox, Microsoft or Google. 15 Gigabyte of storage free, unlimited storage with a Office 365 subscription for $69.99 per year when bought directly from Microsoft for a 1 PC license. Discounted options are usually available on third-party sites. On Amazon for instance, you get Microsoft Office 365 Personal for $89.98 which is the five user/system license that retails for $99.99 usually. Google does not offer unlimited storage yet. Users get 15 Gigabyte of free storage space with their account which they can increase to up to 30 Terabytes. A 1 Terabyte plan is available for $9.99 per month or $119.88 per year. 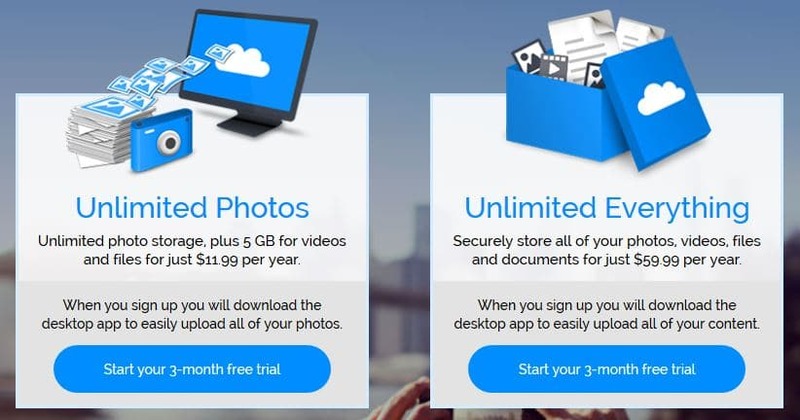 Dropbox users get 2 Gigabyte of storage space for free. A Pro account is available that adds new features to the account and increases the storage space to 1 Terabyte for $9.99 per month or $119.88 per year. As far as price per Gigabyte is concerned, Amazon's new unlimited everything plan offers more storage for the Dollar as any other service. While that is one important metric, there are others to consider. For instance, which additional features come with the plan, which devices are supported and how good is the synchronization client? Probably the biggest issue right now is how Amazon's Cloud client works, at least on desktop systems. The only option you get to sync files with the cloud is to drop folders into the interface. That's less practicable as using a root folder which the majority of other cloud storage services use for that operation. In addition to that, it lacks viewers for many file types. It is for instance not possible to read documents online let alone edit them. This does not have to be a problem depending on how you plan to use the storage. If all you want is to move tons of files to the cloud then this may very well work for you. Now You: Are you using Cloud Storage services? If so which and why? Amazon just announced a new Unlimited Everything cloud storage plan that gives customers unlimited online storage for $59.99 per year. I always smile when I see unlimited attached to some offer online. Everything is limited. The so-called unlimited offers (believe it or not) are more limited than the normal limited offers. Don’t let them fool you. Always read the fine print. It could save you some nightmares. also unlimited lock-in, once they lure users in they can hold their files hostage. There is a dark side of the cloud that former Bitcasa customers know all too well. When the company decided to change direction and be businesses only they deleted everyone’s files on 3 weeks notice. That’s after they sent out emails demanding to know why some users were using so much space. Richard you are right. I have modified the paragraph about Microsoft accordingly. http://www.fileapartment.com already offers unlimited storage for a much better price. I fell into a trap a while ago where I paid 60$ for an unlimited online backup for life. Within a year the company sold out and I was sent an email basically telling me to pound sand. Never again. I’d trust Amazon to be around for the long haul before I trust any other no name company again. I use OneDrive (with an Office 365 sub) as my main cloud storage and now have things set such that my docs, pictures, music and video folders (some 350GB of data in total) are contained within the OneDrive folder on my PC so as a file is added or changed it is uploaded. Indeed the only thing I have not uploaded to OneDrive are drive images which just take too long to upload on my 3mbps upstream connection. I like the fact that it makes it easy to work with and view office docs on-line (and keeps the last 25 versions of the same) as well as view pictures and even stream video. Only thing it lacks is ability to stream my music (but that may be coming). For secondary cloud storage of various data I use the free versions of Google Drive, hubiC and Megasync. And I’ve also backed my music (some 10,000 tracks) up to Google Play music which allows you to store up to 50,000 tracks for free and play them back from any connected device. This is not a like for like backup since Google Play music converts my mostly lossless (FLAC) encoded collection to 320kbps MP3 but for access to my music on the go its great (even if the Play interface isn’t). 350 Gigabyte with 3 Mbps upload, wow that must have taken some time. Microsoft is introducing an “upload music to OneDrive” option as well which integrates with Xbox Music. It did indeed (since it equates to a max of 1350MB/hour probably more like 1000MB/hr or thereabouts actually). Done over a period of months, though to give things a boost left the computer running overnight and during the day (when out at work) on a number of occasions! Beauty of it though is that now its done typical uploads are small (particularly with office files) and take very little time and I have access to all my data wherever I may be. peter. your wishlist is fulfilled now. just drop your music collection in Music folder inside One drive and it will show up in your xbox music app for streaming. it has same limit as Google 50000 songs. Thanks for that the only issue for me is that it will only stream MP3 and WMA files meaning that the two thirds of so of my music that is encoded in FLAC is a no show. Still it did pick-up some 3000 or so tracks for streaming playback. The problem with moat cloud storage is that if is a place to hoard. If I change or delete a file, I want it to sync, not upload another copy. Google photo sync is the worst since it syncs files you have deleted so you end up with a ton of crap you don’t want. I just wish that Dropbox wasn’t so expensive, I prefer that service and I would like to keep everything in one place. If they had a 100gb plan for $2 a month or similar it would be great, I don’t need a whole terabyte. you living in past. I have microsoft one drive now that started out with 15 GB but they keep giving you more GBs time to time. I have 220 GB now and i am not subscriber. if you use Bing as search you can buy 100GB from bing reward and it does not take that long to collect that much bing rewards. I use bing any way so it keep stacking rewards and i use it to buys apps etc whenever i needed too. good luck with dropbox. it was good app when it came out but onedrive hands down beat any cloud storage. I don’t care about the feds, because I wouldn’t put sensitive data unencrypted on the Internet. I care about loosing my files. I had an external USB drive with all my music CDs and many games ripped. Unfortunately it failed and I had to re-rip it again – hours of work lost. That’s why this Amazon Cloud Drive looks promising as a second, off-site backup target. In fact I’ve just started the unlimited trial to see how it works. Does anyone have any Amazon Cloud horror stories to share? I’ve heard about Amazon remotely deleting Kindle books, but I don’t remember Cloud Drive or S3 being featured in the news because of lost files (although S3 is regularly featured when they have downtime). I have a 1Tb cloud service from Mediafire that’s only $2.49/m but if you pay for the whole year in advance, they knock off $10, so it only cost $24.99 a year. They did have a simple 100Gb package a few months ago for only $1.99, but when Firedrive made the move to purchase Putlocker, they redesigned their site to start at 1Tb for paid plans. There is no 2Tb personal account. To get 2Tb we’d have to open a business account which starts at 1Tb to 100Tb currently. Freebie accounts are opened at 15Gb, and over the course of weeks, you’ll be upgraded to 50Gb for free. At that point you’ll be given the option to download their desktop app, which will provide another 5Gb free space, link a Facebook account … another 5Gb space, download the mobile App… more free space and invite up to 30 friends to join (1Gb per friend) for a total of 100Gb for free. With our personal accounts we can drag-n-drop into the browser window to upload to our accounts, or download the Explorer extension and upload by R clicking a file. Or drag-n-drop files onto their desktop icon and it will be uploaded to your account. Mediafire has been opened since 2006 and I’ve been a member since then. I’ve had no problems with them whatsoever, I can upload music, videos, documents and programs. I can make open access folders so that anyone I give the link to can drop files into that folder. Perfect for companies starting out or families wanting a place to exchange stuff. I use it for vacation photos because with their online photo album, music and video player, family members can view, watch or listen to content I wish to share without needing to download stuff, or me overflowing their inbox by trying to upload vacation photos. They have the option to view, watch, listen or download. As for bandwidth, I’ve never had a problem and I’ve shared hundreds of files and hundreds of Gigabytes with several hundred plus people and never encountered a bandwidth problem or limit. I download at top speed and I upload at top speed as set by my ISP. As for my comment on Amazon as a cloud source. What you need to read is the fineprint Martin. Amazon states anything posted or saved to their servers is their property and they can do whatever they wish to stuff we say, do, or saved with them. So Amazon as a cloud service… no thanks. Besides, Mediafire encrypts our stuff so we have a higher level of security. No one can simply search for our stuff anywhere and only those who are given the links can download/upload (if the folder is a open shared one). Or a 70M compressed file *(file is part 30 of 30 segments and pretty useless without parts 1-29). Oh I did forget to mention, the freebie accounts are limited to 200M per file upload and I uploaded that 30 part split file when I was a freebie member. I never got around to uploading the whole main program in lessor parts because as we all know, breaking apart a large file into smaller chunks can take a long long time and that files original size is 6Gb, compressed and split apart into individual 200M blocks. If and when you change to a paid account our upload file size limit is 20Gb per file. Amazon seems like a service for people who don’t know any better then claim it’s the best around without even knowing what else is around. I don’t even bother with their android apps anymore. One Drive randomly deleted files, I quit using it although it’s 25 gigs of free storage. I quit using dropbox because it started getting too intrusive and provided very little storage. Google Drive is my main storage which I back up to Copy. If Hubic had a Linux version I would use it more often. No thank you, Amazon. I clone to a hard drive 1x/week and backup data to two other hard drives daily. It’s free. And you are still pretty limited in protection. Where are you data in case of fire, flooding, earthquake…? Living in the US, which has some of the slowest and most expensive broadband service in the developed world, my take on these storage offers is that they are akin to “all the free water you can use” (for your Olympic-sized swimming pool! for your personal water park! ), delivered through a $70-a-month juice-box drinking straw. If I lived in Seoul or Paris, I might think about it. To get my interest it needs a desktop client with at least a root directory synchronization. At least in its cloud products and services I expect Amazon to be a persistent force but need protection against any vendors whims and fate, even Amazon. I’m using MEGAsync for two good reasons: 50 GB of free storage and a sophisticated security system. I’m very satisfied. Regards. I love Amazon, but I’m not paying for its cloud storage. I’m sorry for the inconvenience caused. I’d be pleased to assist you with further information. All the music and ebooks that you’ve purchased from Amazon will be stored by us in your libraries and will never count towards cloud drive storage. So you can still have all your purchased music and send to kindle documents without any issues. The new plans will only affect if files have been uploaded to cloud drive. I’ve checked your account and see that you’ve never used the service and will never be charged for it. You won’t be charged or auto-enrolled into a free trial or paid plan, and if you don’t wish to enroll in a free trial, you can select “Not Now” when logging into your Cloud Drive account. I’ve taken your comments as a feedback about not supporting free storage for our valuable customers and requested the business team to further look into this and have a necessary step rolled out. Customers valuable feedback like yours helps us enhance and make services better. Have I mentioned that I love Amazon? This is why. If anyone wants to know: I’m testing Amazon Drive now and the upload speed is limited to 0.5 MB/s (my location: Poland). Uploading 1 TB of data will take 23 days. Given that I want to use it to have an offsite backup of my archive (ripped CDs, purchased digital music/software, MSDN isos etc) – things that never change, it should be ok for my needs. What Amazon fails to tell you is that the upload speed is around 2.5K which renders it nearly useless.